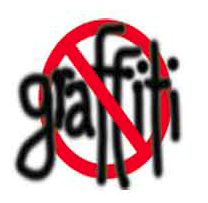 The City of Grover Beach offers a free Graffiti Abatement Program. The City will remove graffiti from walls or surfaces publicly visible on private property or public property. Graffiti can be reported 24 hours a day by calling the Police Department’s non-emergency telephone line at (805) 473-4511 or by submitting our online Request for City Service Form to the Public Works Department. Once a Release of Liability and Agreement is processed, every attempt will be made to abate the graffiti within 48 hours. The City will remove graffiti by sandblasting or painting the surface in a color to match as closely as possible to the original surface color. For more information regarding this program, please contact the Public Works Department at (805) 473-4520.